Watch Dogs, Forza 5 and FIFA 14? Pah! Despite Nintendo's paper-thin array of top notch Wii U games, the company's boss in the U.S. has seen fit to throw a derisory 'meh' in the direction of Sony and Microsoft's forthcoming consoles. Nintendo of America COO Reggie Fils-Aime needed just one three-letter colloquialism to deliver his damning verdict on the Xbox One and Sony PS4 'Day One' games line-up. Showing a bizarre lack of self-awareness, (which some might be bold enough to call bitterness), Fils-Aime told IGN: "It's all about the games. The competitive systems have announced their launch lineups. I'm allowed to say 'Meh.'" The U.S. chief prefers the Wii U's existing and forthcoming line-up of titles, made up of old-faithfuls like Zelda, Mario and Donkey Kong, rather than exciting new IPs from in-house or third-party devs. He added: "I look at our lineup of titles and I feel good about our lineup. We've got Zelda. We've got Mario. We've got Donkey Kong. In addition to great titles like Pikmin 3 and Wonderful 101, I feel very good about our lineup, and I feel very good about the value proposition we're putting out there for the consumer." Fils-Aime's proclamation is even more surprising given his company's self-professed missteps in giving users a compelling reason to snap up its next-gen console. The Wii U is approaching a year on sale, yet sales of the console are grinding to a halt. The company caved on an official price cut earlier this week, months after some retailers began dropping the price without Nintendo's consent, while developers like EA and Ubisoft are distancing themselves. His comments are also rather unexpected given the near-universal praise lavished upon Microsoft and Sony for the next-gen titles rolling out in alongside their consoles this coming November. Microsoft has claimed its 23 initial titles represents the greatest day one line up "in the history of consoles." 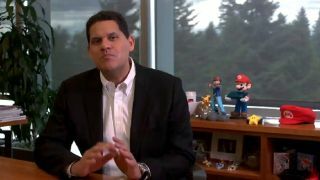 Has Reggie got a case of the green-eyed monster or is he dropping some truth bombs amidst all the hype? Let us know your thoughts in the comments section below. We've updated our PS4 review. Check it out!